This article is about the gemstone. For the characters in the Sailor Moon series, see Amazon Trio. Tiger's eye (also called tiger eye) is a chatoyant gemstone that is usually a metamorphic rock that is a golden to red-brown colour, with a silky lustre. Members of the quartz group, Tiger's eye and the related blue-coloured mineral Hawk's eye gain their silky, lustrous appearance from the parallel intergrowth of quartz crystals and altered amphibole fibres that have mostly turned into limonite. The gems are usually cut en cabochon in order to best display their chatoyancy. Red stones are brought about through gentle heat treatment. Dark stones have had their colours improved and been artificially lightened using nitric acid treatments. Honey-colored stones have been used to imitate the much higher valued cat's eye chrysoberyl (cymophane), but the overall effect is unconvincing. Artificial fibre optic glass is a common imitation of tiger's eye, and is produced in a wide range of colours. Tiger's eye comes primarily from South Africa and east Asia. Tiger iron is an altered rock composed chiefly of tiger's eye, red jasper and black hematite. The undulating, contrasting bands of colour and lustre make for an attractive motif, and it is mainly used for jewellery-making and ornamentation. Tiger iron is a popular ornamental material used in a variety of applications, from beads to knife hilts. Tiger iron is mined primarily in South Africa and Western Australia. Tiger's eye is composed chiefly of silicon dioxide (SiO2) and is coloured mainly by iron oxide. The specific gravity ranges from 2.64 to 2.71. It is formed by the alteration of crocidolite. 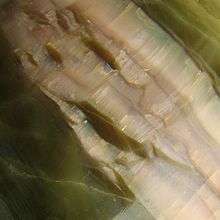 Serpentine deposits in which are occasionally found chatoyant bands of chrysotile fibres have been found in the US states of Arizona and California. These have been cut and sold as "Arizona tiger-eye" and "California tiger's eye" gemstones. 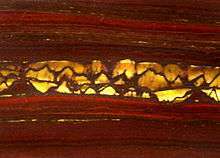 The trade name of pietersite is used for a fractured or brecciated chalcedony containing amphibole fibers and promoted as tiger's eye from Namibia and China. Common sources of tiger's eye include Australia, Burma, India, Namibia, South Africa, United States, Brazil, Canada, China, Korea and Spain. ↑ "Tiger's Eye". mindat.org. Retrieved 16 May 2016. ↑ Heaney, Peter; Fisher, Donald (April 2003). 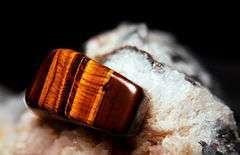 "New interpretation of the origin of tiger's-eye". Geology. 31 (4): 323–326. doi:10.1130/0091-7613(2003)031<0323:NIOTOO>2.0.CO;2. Retrieved 16 May 2016. ↑ O'Donoghue, Michael (1997). Synthetic, Imitation, and Treated Gemstones. Boston, Massachusetts: Butterworth-Heinemann. pp. 125–127. ISBN 0-7506-3173-2. ↑ Flagg, Arthur Leonard (1958). Mineralogical Journeys in Arizona. Scottsdale: F.H. Bitner. pp. 92–93. ↑ USGS (1908–1909). "Cat's Eye or Tiger-Eye". Mineral Resources of the United States / Department of the Interior, United States Geological Survey. Washington, D.C.: US Government Printing Office. 2: 802. ↑ Schumann, Walter (2009). Gemstones of the World (Fourth ed.). New York, New York: Sterling Publishing. p. 140. ISBN 978-1-4027-6829-3. Wikimedia Commons has media related to Tiger's eye.